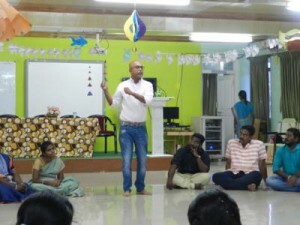 A three-day In-service Teacher Education Programme on “Innovative Pedagogical Interventions & Creative Teaching Aptitude” was held from October 29 to 31, 2018, in Puducherry for In-service Teachers working with the Directorate of School Education (DSE) in Puducherry. The Programme was developed by Theatre Arts in Integral Education (TAIIE) practitioner Ravi Shankar and was facilitated, along with Arts & Craft in Education enthusiasts Kiran & Hrishikesh, as an additional part of Sri Aurobindo Society’ transformative initiatives started as Rupantar. Thirty participants underwent a transcendental journey through this programme on the creative learning approach to Integral Education. The Programme gave all the participants a wider perspective on the aspects of Education and its role in today’sworld. 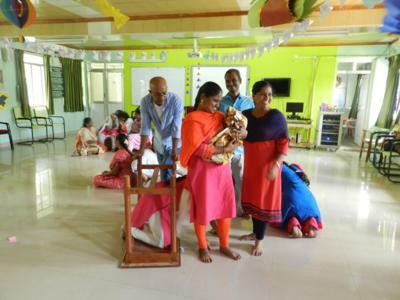 Participants enjoyed experiencing the process of creative teaching through project works based on theatre and visual arts. 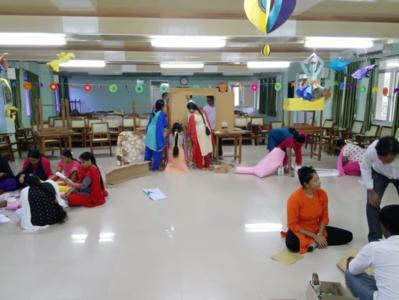 The whole process sensitized them towards their role as compassionate and creative teachers and elevated them to the summit of their consciousness. Exploring the contextual and creative approach to integrated learning processes connected them to their inner realm of unitive qualities. 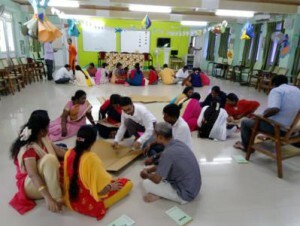 Finally, the Programme has culminated with deeper reflection which resulted in chalking out their plan of action in regard to using all the innovative practices explored during these three days, to foster the integral development of their children. With the vibrations of renewed enthusiasm, joy and perspectives, they celebrated their valediction. This programme is very useful and good for us. It is something different from earlier training programmes. This training is fully based on activities and games. This is one of the easy ways to attain the expected learning outcomes. This pedagogy is totally child-centered. First of all, I have learned to see the beauty of others. I learned to connect all the learning outcomes from all the subjects and create an atmosphere in which we can involve all types of students. So that everybody in the class is encouraged to participate and our ELO is achieved. Code2 Abacus is available in our school but I didn’t know about that. Now I came to know about the usage of that. I will also teach my students. Hrishikesh sir explained clearly. I feel learning through activities is a very effective way of teaching. Through this way, peer learning is empowered. Learning by doing or acting, students will know about their surroundings and the theme of the lessons properly . . . Learned how to use natural resources for teaching. I have experienced creative teaching. The three days training is very useful and valuable. These types of pedagogical interventions are relevant to today’s need for change in our existing education system. So far, I didn’t attend this type of training before. Really, very nice and helpful for my teaching and for myself. I feel so happy to attend this training because it is activity based. 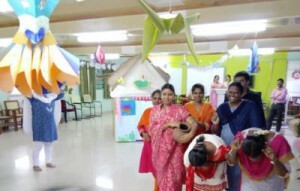 Each and everybody participated in all the activities with full interest. Kiran mam’s meditation and physical exercises were very nice and Hrishikesh sir explained how to use the abacus. It was superb and he gave a chance to everyone. Overall, I like this training very much. Earlier we used to teach one subject at a time but now we can integrate language, Maths, EVS. Students will easily understand the topics through activities which is relevant to day-to-day life. They understand the theme by doing, so it will be concrete. Instead of memorizing they will learn by action and it will also be easy to attain the learning outcomes. I think this is the best teaching method I learned during these three days camp. It covers all type of learners and creates interest in learning. Self-interest for learning can be developed through this. Eagerness, efficiency, involvement are developed. No recitation practice takes place. The concept can be clear through practice. Each and every individual can participate. Before training the role of students and my role with them was very difficult, but now it would be easy to take care of them and to teach them in a creative way to meet the learning outcomes. I would like to incorporate these pedagogical ideas in my school. This is a very effective way of learning the subjects with hands-on experience. Children will love and happily accept this method. This is enjoyable and contextual. If we incorporate this method, this will definitely be successful. This programme stimulates my mind to teach without TLM. Ms. Kiran’s yoga gives power to my mind. This is completely a new experience I got during this camp. We learned how to create a creative learning environment for students. It covers all the expected learning outcomes of all the subjects.